NEW DELHI: The Caribbean Islands for long now, has been a playground of the rich and famous. It exudes uber indulgence like few places can, boasting a lifestyle that makes it a luxury haven. Seekers of both privacy and comfort make a beeline for it. It’s no surprise then that St. Kitts, one of Caribbean’s boutique islands, has an airport that is as much an attraction as any other landmark on the island. The airport’s private jet terminal, the YU Lounge, has been designed as the New Caribbean Gateway, a uniquely-crafted door-to-door arrival and departure exclusive 5-star experience, where global influencers can arrive and depart with expert service and attention to detail. Designing to exude elegance and understated lavishness, requires an in-depth understanding of all things luxury—an area of expertise for Bobby Mukherji & Associates. Despite some top design firms prevalent in and around Miami which is only 2 hours away, One of India’s best design firm was tapped to create this marvel. The firm has the distinction of being the only one from India to have won such a prestigious assignment among other projects executed by them across the globe. Thus, catering to super high net worth individuals and their friends and families—who own yachts, aircraft, or charter planes, as well as world travellers who opt for the comforts of 1st class seating on commercial flights—makes this luxe new private jet (FBO) terminal the epitome of the finest things in life. Acutely aware of the inflow of crème de la crème travellers making this a pit-stop via yachts and small aircrafts to travel to the nearby islands dotting the Caribbean (Grenada, Barbados, Antigua, Anguilla, St. Lucia, St. Barthelemy, St. Martin, Dominica and more), Bobby Mukherji & Associates has designed the terminal to be a microcosm of Island luxury. 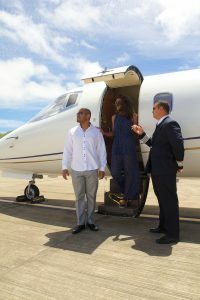 Global industrialists, European royalty, Silicon Valley mavens Paul Allen and Sean Parker, Hollywood celebrities like Daniel Craig, Steven Spielberg, Beyoncé and Jay Z were among the first to receive a glorious welcome at the St. Kitts private jet terminal.